One thousand San Francisco activists are standing up (by lying down) against the hugely unpopular Supreme Court ruling. With rigged debates, pay-to-play races and a money-mad media that feeds at the same corporate trough as the candidates, what’s a person to do to send a message in today’s America? San Francisco taxi driver Brad Newsham decided to get down and if not dirty, then at least sandy. This Saturday, with 1,000 like-minded people, he lay his body down on a San Francisco beach and spelled out “DUMP CITIZENS UNITED!” in huge human letters, complete with exclamation mark. The enormously unpopular Supreme Court ruling may not get much visibility in the televised debates, but the message sent by 1,000 bodies on a beach was visible from miles away to anyone traveling through San Francisco airspace. Is this what’s left of our democracy? Freedom of beach? Not quite. The action this Saturday was part of a collaboration between Newsham and The Other 98 Percent, with a slew of groups (including Common Cause, CREDO Action, Amend2012, Free Speech for People and Public Citizen) which are all working hard to pass Measure G, a city ballot initiative which like myriad others around the country calls on Congress to reverse the Citizens United vs the FEC ruling. Still, our censored and servile media debate don’t come close to expressing how deeply people feel about money in politics. To fill the gap, we’ve cut a series of short interviews with pro-democracy activists, in which they talk not just about what’s wrong, but why Citizens United moves them to act. Check out the first two, with The Nation’s Katrina vanden Heuvel and Lisa Graves of the Center for Media and Democracy (originally posted here) and feel free to repost, record your own, talk back. 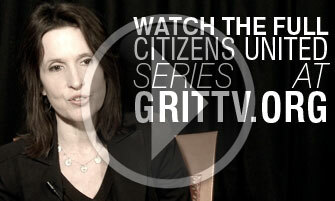 These interviews were originally recorded in the spring of 2011 by GRITtv for Free Speech For People. For more on Citizens United, check out Lee Fang on why Saudi businesses can now influence U.S. elections.